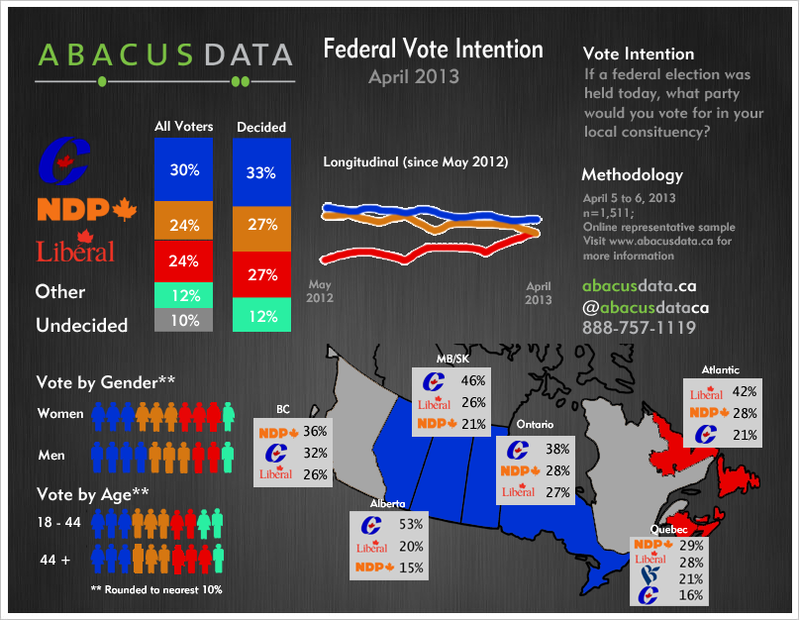 According to a new national survey by public opinion firm Abacus Data, support for the federal Liberal Party among decided voters increased by three points since mid-March while the federal NDP is down four points over the same period. The Conservative Party holds a six point lead over both the NDP and Liberal Party. Nationally, the Conservative Party has the support of 33% of decided voters followed by the NDP at 27%, the Liberals at 27%, and the Green Party at 7%. Regionally, the Conservative Party continues to dominate in Alberta (53%) and in Manitoba and Saskatchewan (46%) while holding a ten point lead in Ontario (38%). East of the Ottawa River, Conservative support is weakest with 16% in Quebec and 21% in Atlantic Canada. In Quebec, the significant NDP lead observed in March has disappeared with the NDP and Liberal Party running neck and neck (NDP 28%, Liberal 27%) with the Bloc Quebecois not far behind in third place (21%). In British Columbia, the NDP and Conservatives are still locked in a close race (NDP36%, Conservative 32%) but the Liberal Party has made a small gain rising to 26% among decided voters. The Liberals continue to lead in Atlantic Canada (Liberal 42%, NDP 28%, Conservative 21%). If Justin Trudeau wins the Liberal leadership this weekend, he starts off in a strong position when it comes to his overall image and in some key leadership attributes. Overall, 43% of respondents said they have either a very positive (11%) or mostly positive (32%) impression of Mr. Trudeau compared with 21% who have either a very negative (6%) or mostly negative (15%) impression. Thirty-seven percent of respondents said they were neutral towards the Liberal MP from Montreal. Overall, his personal image is weakest in Alberta, where only 30% say they have a very or mostly positive impression of him.Regionally, Trudeau is most liked in Atlantic Canada (net +42) and his native Quebec (+28) but also has high overall favourable ratings in Ontario (+21), especially in the vote rich suburban region around Toronto (905 area code, +29). Nonetheless, his appeal is not confined to younger Canadians, as he registers a net positive impression with even those aged 60 and over.Along with a fairly robust national image, Trudeau’s popularity also crosses all age and gender groups. He is most popular among women (+29) and among those aged 30 to 44 (+29). As a member of Generation X, there is an opportunity for Trudeau to connect with this group and be the first Gen X national leader in Canada. Perhaps the most striking finding of the survey is the broad level of positive feelings voters of the three main centre or centre-left parties have for Justin. Not surprisingly, he is loved by those who voted Liberal in 2011, but he also commands very high net positives from NDP voters (+32) and among Green Party supporters (+48). While his main competitor for the Liberal leadership, Joyce Murray, proposes cooperation between the Liberals, Greens, and NDP, Justin has the potential to unite many progressive and centre-left voters under his banner. We have not seen this type of broad based positive reaction to a leader or potential leader since Jack Layton’s surge near the end of the 2011 federal election. 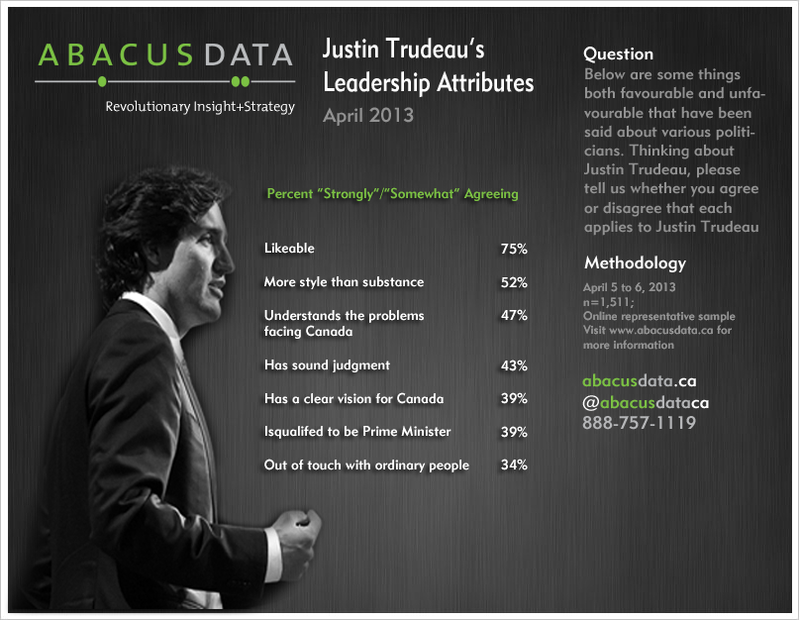 Respondents were shown a series of statements that could be used to describe Justin Trudeau, and were asked whether they agree or disagree that the statement applies to Mr. Trudeau. Overall, most respondents agreed that he was likeable (75%) while a majority agreed that he is “more style than substance” (52%). A large plurality of respondents also agreed that he understands the problems facing Canada (47%) and has sound judgment (43%). Where there is less consensus about Trudeau is around his vision for Canada – 39% agreed he has a clear vision for Canada – and whether he is qualified to be Prime Minister (39% agreed). Justin Trudeau has brand attributes that no other leader can compete with at the moment. He is seen as likeable, empathetic and having sound judgment – all foundational attributes to a good leader. However, he still has to prove to more Canadians that he’s qualified for the job to be Prime Minister and has a clear vision for where he wants to take the country. With the next election still two years away, he has time to develop and market his vision and demonstrate competence to lead. On the other hand, his opponents also have time to weaken what is clearly a strong and very positive brand image. On Sunday, Canadians will have a much clearer sense of what the political menu will look like come the 2015 federal election. The federal Liberal Party members and supporters will elect a new leader who will likely be the party’s standard bearer in the next election. All signs point to a Trudeau victory and, based on our latest polls, this is likely to be the right choice for the party considering the candidates on offer. The Liberal Party is now tied with the NDP among decided voters, nationally gaining seven points since the beginning of 2013. The party leads in Atlantic Canada, is competitive in urban and suburban Ontario, and is now trending up in Quebec and British Columbia. While vote splitting will still benefit the Conservatives, especially in Ontario, the numbers clearly indicate that unlike Tom Mulcair or Elizabeth May, Justin Trudeau has an opportunity to consolidate progressive voters and fatigued former Conservative voters into a winning coalition. He is poaching support from the NDP and Greens while non-voters are at least giving Trudeau a look. Along with progressive voters, Trudeau and the Liberals are attracting, at least for now, 10% of Conservative voters from 2011 say they would vote Liberal if an election were held today. Those voters are concentrated in the Greater Toronto and Vancouver areas – two key components of the coalition that elected three straight Conservative governments. A majority or at least a larger plurality of Green and NDP supporters have a positive impression of Trudeau also seeing him as likeable, capable, and empathetic – a lethal combination for Tom Mulcair who is trying to compete for the same voters. Now before we consider the next election over and crown Trudeau Prime Minister, let’s consider some other historical data. The Liberals saw similar bounces in support after Stephane Dion and Michael Ignatieff were selected as party leader in 2006 and 2009, respectively, only to see those honeymoons subside. We all know how the 2011 federal election turned out for the Liberal Party. But there is no denying that the leadership race and the ascendency of Trudeau to the leadership of the party will give the Liberals an opportunity to reconnect with many voters who gave up on the party since 2006. For the first time in a while, the Liberal brand and its leader (if Trudeau wins) will be the fresh face. As we have said before, the contrast between Trudeau, Mulcair, and Harper could not be more clear. The Trudeau brand is positive, strong, and well defined. We just don’t know if it’s resilient. Stay tuned. The survey was conducted online with 1,511 respondents in English and French using an internet survey programmed and collected by Abacus Data. A random sample of panelists was invited to participate in the survey from a panel of over 150,000 Canadians. The survey was completed from April 5 to 6, 2013. The margin of error for a probability-based random sample of 1,511 respondents using a probability sample is +/- 2.6%, 19 times out of 20.